If you think it is difficult to get students excited about learning Chemistry, it is decidedly less hard to get them excited about learning about themselves. So why not harness that willingness to engage and put it to good use, in the form of self-discovery? There are three major types of self assessments that can give students the foundations they need for college and career readiness success: individual strengths, learning style, and personality type/career exploration. Completing these types of assessments will reiterate the importance of planning for their future and help students engage with the school and feel like their educators value them as individuals. 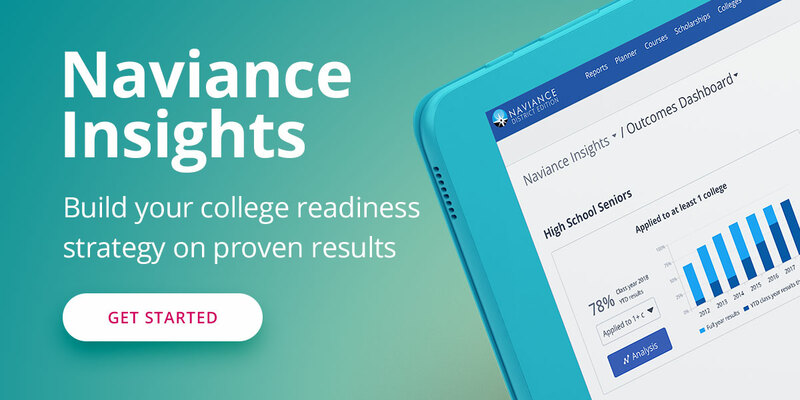 The strengths-based assessment included in Naviance is called StrengthsExplorer®, and is based on 40 years of research by the Gallup Organization. Gallup conducted thousands of studies on the talents of individuals to help students in grades 6-10 discover and develop the unique talents within them. StrengthsExplorer assesses 10 talent themes for individuals and identifies each student’s three strongest emerging talents, such as Confidence, Dependability, or Future Thinker. It provides explanations of these themes, strategies for capitalizing on each, and action items to help students gain insight into their greatest talents – natural patterns of thought, feeling, and behavior – to leverage in the classroom and in life. Once your students have discovered their top three talent themes, devote some time to discussing what each student’s themes mean to them. Have each student share their top three themes and ask them to think about a time in their lives when they’ve used their talents successfully, either in the classroom or daily life. Having students complete these activities early in their education, between grades 6-10, will allow them to use the knowledge throughout their entire high school and college career, for far-reaching results. Another way to engage students is to help them discover their learning style through assessments like the Learning Style Inventory and MI Advantage™. The Learning Style Inventory online assessment diagnoses students’ unique learning styles based on an analysis of their personal preferences in 16 different areas. Those areas include the student’s immediate environment (sound, light, heat, and design), emotionality (motivation, persistence, and structure), sociological needs (self-oriented, peer-oriented, or adult-oriented), and physical needs (perceptual preference(s), food intake, time of day, and mobility). MI Advantage similarly uses the Multiple Intelligence theory to reveal students’ individual intelligence strengths and challenges, such as bodily-kinesthetic, musical, or interpersonal intelligences. At the end of each assessment, a personally tailored report identifies each student’s unique learning style and provides guidance on how to maximize learning potential. These reports can be utilized in the classroom to separate students into groups that learn the same way. Students will be able to help each other learn if they all speak the same “learning language.” For example, a quiet table in the back of the classroom could be reserved for those that prefer to study in silence, or group projects could be divided by which students prefer to learn through tactile, visual, or auditory methods. Or, you could pair up students with high and low levels of particular intelligences for peer learning groups and tutoring or coaching sessions. Understanding how your students learn will allow you to customize their experiences to give them the best environment for their success. Another type of self-assessment in Naviance is personality type. The act of discovering personality types is where many high school students will start on their journey to planning their future careers. There are several assessments available to schools, each assisting in discovering the students’ interests and hobbies and combining his or her personality type to suggest relevant career paths that would be good matches for each individual. Do What You Are® is a personality type assessment. It reveals information about a student’s strengths and blind spots, recommended career paths and college majors, as well as tips for conducting the most effective career search. Career Interest Profiler and Career Key® are online career interest assessments for students based on Holland interest codes. Career Cluster Finder is an online questionnaire that helps students discover career industries that are most interesting to them. You can create a comprehensive college and career readiness program based around these assessments and the results. Start by having students take the assessments, preferably as a guided activity with school counselors or teachers nearby to help. As the assessments are completed, career pathways will be suggested that match the students’ personality types and interests. Students can then save careers and career clusters to their Family Connection portfolio and research potential colleges and majors they can study to pursue that career path. College counselors can also use information about saved careers to plan a career fair and guest speakers. Students could participate in a career fair scavenger hunt, needing to collect information on all of their saved career clusters in return for a prize. Engaging students through self-discovery is an easy way to get students to think about college and career readiness, which is a double-whammy in terms of school success. Learning about themselves and thinking about future career options are also ways to alleviate boredom and increase the relevancy of coursework in the classroom, both of which can contribute to overall increased student engagement.